This article is about the football manager and former player. For the fencer, see Antonio Conte (fencer). Antonio Conte (Italian pronunciation: [anˈtɔːnjo ˈkonte]; born 31 July 1969) is an Italian professional football manager and former player. Playing as a midfielder, Conte began his career at local club Lecce and later became one of the most decorated and influential players in the history of Juventus. He captained the team and won the UEFA Champions League, as well as five Serie A titles, among other honours. He also played for the Italy national team and was a participant at the 1994 FIFA World Cup and UEFA Euro 2000, where, on both occasions, Italy finished runners-up. His managerial career started in 2006, leading Bari to the 2008–09 Serie B title, and Siena to promotion from the same division two years later. He then took over at Juventus in 2011, where he implemented a 3–5–2 formation and won three consecutive Serie A titles, before taking charge of the Italian national team in 2014 until the UEFA Euro 2016 campaign. He became the manager of Chelsea in April 2016 and led them to the Premier League title in his first season in charge, later winning the FA Cup in his second season with the team. He was dismissed as Chelsea manager in July 2018. Conte began his career with the youth team of his hometown club Lecce and made his Serie A debut with the first team on 6 April 1986, aged 16, in a 1–1 draw against Pisa. Under manager Carlo Mazzone, he became a fundamental player for the squad. In 1987, he fractured his tibia, running the risk of a career-ending injury. However, during the 1988–89 season, he was back in the pitch, and scored his first Serie A goal on 11 November 1989 in 3–2 loss to Napoli. He amassed a total of 99 appearances and 1 goal for Lecce. Conte was signed by Juventus manager Giovanni Trapattoni in 1991, debuting on 17 November 1991 against cross-city rivals Torino. Due to his consistent performances, work-rate, leadership and tenacious playing style, he became an important figure with the club's fans, and was later named the team's captain under Marcello Lippi in 1996, following the departure of the club's previous captain Gianluca Vialli, and before the promotion of Alessandro Del Piero to the role. During the 1998–99 season, when Del Piero suffered a severe knee injury, Conte returned to the captaincy, a position which he maintained until the 2001–02 season. Conte won five Serie A titles with Juventus, the 1994–95 Coppa Italia, the 1992–93 UEFA Cup and the 1995–96 UEFA Champions League, as well as four Supercoppa Italiana titles, the 1996 UEFA Super Cup, the 1996 Intercontinental Cup (which he missed due to injury) and the 1999 UEFA Intertoto Cup, winning all possible top tier club titles, aside from the UEFA Cup Winners' Cup. Along with his team, Conte also finished as runner-up in the Champions League on three other occasions, as Juventus lost the Champions League finals of 1997, 1998 and 2003. In the latter final, against Milan, he came on as a substitute in the second half and produced Juventus' best chance of the match, hitting the crossbar with a header, although Juventus eventually lost the match on penalties following a 0–0 draw after extra time. Conte also finished runner-up in the 1995 UEFA Cup Final with the club. He remained with the Turin-based club until his retirement in 2004. During his 13 seasons with Juventus, he made a total of 295 appearances and 29 goals in Serie A, and 418 appearances and 43 goals in all competitions. Conte also played for the Italy national team, making his debut on 27 May 1994, in a 2–0 friendly win over Finland at age 24, under Arrigo Sacchi. He was a member of the Italian squads for both the 1994 FIFA World Cup under Sacchi, and UEFA Euro 2000 under Dino Zoff, achieving runners-up medals in both tournaments. However, he missed out on the Euro 1996 squad after sustaining an injury in the 1996 Champions League final. Conte scored a bicycle kick in Italy's opening match of Euro 2000, which ended in a 2–1 win against Turkey, although he later suffered an injury in a 2–0 win against Romania in the quarter-finals of the competition, following a challenge from Gheorghe Hagi, which ruled him out for the remainder of the competition. In total, he made 20 international appearances for Italy between 1994 and 2000, scoring twice. Considered to be one of the most important Italian midfielders of his generation, Conte was regarded as a quick, combative, energetic, and tactically versatile footballer throughout his career who could play anywhere in midfield but was usually deployed as a central, box-to-box, or defensive midfielder, and occasionally on the right flank, due to his crossing ability. Although he was not the most naturally talented or skilful footballer from a technical standpoint (although he was able to improve in this area with time), Conte was a hard-working, consistent and intelligent player, with an innate ability to read the game, who was mainly known for his leadership, strong mentality, accurate tackling, stamina, and vision; these attributes, coupled with his solid first touch, work-rate, tenacity, and a tendency to make offensive runs into the area, enabled him to aid his team effectively both defensively and offensively, and gave him the ability to distribute the ball and start attacking moves after retrieving possession, as well as the capacity to turn defence into an attack. Due to his ball-striking from distance and ability to get forward, he also scored some spectacular and decisive goals, often from volleys and strikes from outside the area. He was also considered to be physically strong, good in the air and accurate with his head, despite not being particularly tall. Despite his ability as a footballer, his career was often affected by injuries. After retiring from playing, Conte worked as an assistant manager for Siena alongside Luigi De Canio in the 2005–06 season. In July 2006, he was appointed coach of Serie B side Arezzo. However, after a series of disappointing results, he was sacked on 31 October 2006. 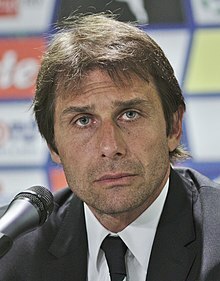 On 13 March 2007, Conte was reinstated as Arezzo head coach as his predecessor Maurizio Sarri failed to gain any significant improvement with the club mired in a relegation struggle. He subsequently led the team to five consecutive wins, securing 19 points from 7 matches, which allowed the Tuscan side to close the points gap between them and safety. In spite of this turnaround in form, Arezzo was relegated to Serie C1 on the final day of the league season, finishing one point behind Spezia. 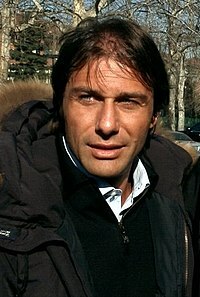 On 27 December 2007, Conte was appointed by Bari to replace Giuseppe Materazzi for the second half of their 2007–08 Serie B campaign. He oversaw a considerable upturn in form, leading the team out of the relegation battle and placing them comfortably mid-table. The following season, 2008–09, Bari were crowned Serie B champions, being promoted to Serie A for the 2009–10 season, Conte's first major honour as a manager. In June 2009, after weeks of rumours linking Conte to the vacant managerial role at Juventus, he agreed in principle for a contract extension to keep him at Bari for the new season. However, on 23 June, Bari announced they had rescinded the contract with Conte by mutual consent. After Claudio Ranieri was sacked by Juventus, Conte was again reported to be a potential replacement. Shortly prior to Ranieri's termination, Conte had made public his ambition to be Juventus coach at some stage and was confident he was ready for the demands of the role. Again, Juventus declined to hire their former midfielder and appointed Ciro Ferrara instead. On 21 September 2009, Conte replaced Angelo Gregucci as manager of Atalanta. Despite a good start at the helm of the Orobici, the club found itself struggling by November, leading to protests from local supporters and friction between Conte and the club's ultra supporters. 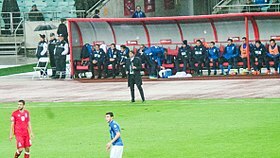 On 6 January 2010, Conte was repeatedly confronted by Atalanta fans during a home game against Napoli which ended in a 0–2 defeat for the Nerazzurri. The match ended with Conte receiving police protection to avoid an altercation with the Atalanta ultras. The next day, Conte tended his resignation to the club, leaving them in 19th place. On 9 May 2010, Conte was announced as new head coach of Siena, with the aim of leading the Tuscan side back to the top flight after relegation to the 2010–11 Serie B. Conte successfully secured promotion for Siena, which would be competing in the 2011–12 Serie A season. 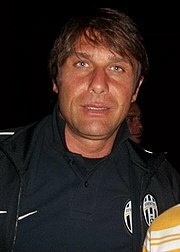 On 22 May 2011, Juventus sporting director Giuseppe Marotta announced Juventus had appointed Conte as its new head coach, replacing Luigi Delneri. Conte arrived amid high expectations that he, a former fan favourite as a midfielder for the club, would lead them back to the summit of the Italian and European game. His first ten months as manager saw the club reach a number of landmarks such as, following a 5–0 win over rivals Fiorentina, equalling Fabio Capello's run of 28 unbeaten matches between November 2005 and May 2006. 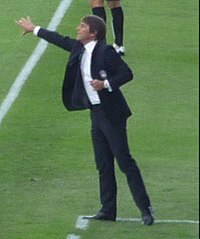 On 20 March 2012, Conte became the first coach to lead Juventus to a Coppa Italia final since Marcello Lippi in the 2004 Coppa Italia Final. On 25 March, following a 2–0 victory at the Juventus Stadium, he became the first coach to complete the league double in the Derby d'Italia against rivals Internazionale since Capello in 2005–06. In November 2012, Conte was awarded the Trofeo Maestrelli, an award honouring the three best Italian coaches working in the professional league, the country's youth coaching system and outside Italy, respectively. Despite drawing a large number of matches during the season, on 6 May 2012 Conte led Juventus to their 28th league title with one match remaining by beating Cagliari 2–0. After beating Atalanta 3–1, Juventus finished the league unbeaten, the first team to do so since Serie A expanded to 20 teams and 38 rounds. Conte's innovative 3–5–2 formation, which featured wingbacks and two box-to-box midfielders in a three-man midfield, gave more creative freedom to the newly acquired deep-lying playmaker Andrea Pirlo, who was key to the club's success that season. The club's strong and highly organised three-man back-line, which was predominantly composed of Giorgio Chiellini, Leonardo Bonucci, and Andrea Barzagli, was regarded to have played a large part in the title triumph, and only conceded 20 goals, finishing the league with the best defence in Italy. However, Juventus lost the 2012 Coppa Italia final to Napoli 2–0, their only defeat in domestic competitions that season. Conte's Juventus won the 2012–13 Serie A title as they accumulated 87 points, three more than the previous season, nine more than second-placed Napoli and 15 more than third-placed Milan. Despite their dominance, Juventus' top goalscorers in the league were midfielder Arturo Vidal and forward Mirko Vučinić, both with just ten goals, making them joint 23rd in the goal-scoring chart. In his first Champions League campaign, Juventus was eliminated by eventual winners Bayern Munich in the quarter-finals, losing 4–0 on aggregate. After winning a second consecutive Supercoppa Italiana in 2013, Juventus won their third consecutive Serie A title under Conte during the 2013–14 season, winning the league with a Serie A record of 102 points. This was also the club's 30th league title. However, Juventus continued to disappoint in Europe and were eliminated from the group stage of the Champions League that season, although they subsequently managed to reach the semi-finals of the UEFA Europa League. On 15 July 2014, Conte resigned as manager. During his three seasons as Juventus manager, he won the Panchina d'Oro for each one, for best Serie A coach of the season. On 14 August 2014, following Italy national team manager Cesare Prandelli's resignation, the Italian Football Federation (FIGC) announced to have agreed a two-year deal with Conte as new head coach of the national team until Euro 2016. With the national side, Conte continued to field formations which he had employed during his successful spell with Juventus, varying between the 3–5–2, 4–3–3, 4–2–4 and 3–3–4, the choice that ultimately replaced Prandelli's 4–3–1–2 midfield diamond formation. His first match as Italy manager was a 2–0 win over Netherlands, during which Ciro Immobile and Daniele De Rossi scored the goals for Gli Azzurri. Conte won his first competitive match on 9 September 2014, defeating Norway 2–0 in their opening Euro 2016 qualifying match in Oslo, with goals by Simone Zaza and Leonardo Bonucci. This was the first time Italy had managed to defeat the Norwegians in Norway since 1937. After ten matches as Italy manager, Conte suffered his first defeat on 16 June 2015, in a 1–0 international friendly loss against Portugal. He sealed Euro 2016 qualification for Italy on 10 October 2015, as Italy defeated Azerbaijan 3–1 in Baku. The result meant Italy had managed to go 50 matches unbeaten in European qualifiers. On 15 March 2016, the FIGC confirmed Conte would step down as manager after Euro 2016. Although many fans and members of the media were initially critical of Conte's tactics and the level of the Italian squad chosen for the competition, Italy opened the tournament with a promising 2–0 victory over the number-one ranked European team Belgium on 13 June. Following the win, Conte drew praise from the media for the team's unity, defensive strength, and for his tactical approach to the match, which impeded Belgium from creating many goalscoring opportunities. Conte led Italy out of the group to the Round of 16 with one match to spare on 17 June after a 1–0 victory against Sweden. Italy had not won the second group match in a major international tournament since Euro 2000, in which Conte had coincidentally appeared as a player. Conte also led Italy to the top of the group, the first time in a major tournament since the 2006 World Cup. After the 2–0 round of 16 win over Spain, Conte's Italy then faced off against rivals Germany in the quarter-final, which ended 1–1 after extra time and 6–5 in favour of Germany after the resulting penalty shoot-out, ending his time as Italy manager. Speaking after the match, Conte said, "[T]he decision to leave the national team after two years was taken early," and that the reason for leaving was because he "wanted to return to the cut and thrust of club football". On 4 April 2016, it was confirmed Conte had signed a three-year contract and would officially become the new first-team head coach of English side Chelsea from the 2016–17 season. On 15 August, Chelsea started off the season with a 2–1 win over West Ham United. On 17 December, Conte set a new club record with 11 consecutive league victories in a single season, following a 1–0 away triumph over Crystal Palace. After securing a 4–2 home win over Stoke City on 31 December, Chelsea recorded a 13th consecutive league victory, equalling Arsenal's 2002 record for most consecutive league wins in a single season. The team's league winning streak came to an end in the following match, on 4 January 2017, in a 2–0 away loss to Tottenham Hotspur. On 13 January 2017, Conte became the first manager in history to win three consecutive Premier League Manager of the Month awards (October, November and December). On 12 May 2017, Conte's Chelsea side defeated West Bromwich Albion 1–0 away, with a late goal from substitute Michy Batshuayi, and secured the points required to win the 2016–17 Premier League title with two matches to spare. Following a 5–1 home win over Sunderland on 21 May, Chelsea also set a new Premier League record for the most wins in a single season, with 30 league victories out of 38 league matches. On 18 July 2017, Conte signed a new two-year contract with Chelsea, keeping him at the club until 2019. Conte was sent to the stands for the first time in his Chelsea career during the first half of a home match against Swansea City on 29 November 2017. He argued with fourth official Lee Mason over referee Neil Swarbrick’s decision to award a goal kick rather than a corner for Chelsea, after which the referee dismissed him. Conte apologised afterwards but was nonetheless charged with misconduct by the FA. On 19 May 2018, Conte led Chelsea to a 1–0 victory over Manchester United in the 2018 FA Cup Final. Chelsea finished fifth in the league at the end of the season, missing out on Champions League qualification. Conte was dismissed as Chelsea manager on 13 July 2018. — Conte on his coaching philosophy. "I did not have Zinedine Zidane or Roberto Baggio's talent as a player, and I have played with both, that even when they were circled they could try to break through or create interesting situations with the ball. When I was a player, my efforts and work-rate, my willingness to sacrifice fitness and humility made up for my lack of pure talent but sometimes, if I didn't find a teammate next to me, I might lose the ball. As a manager, my first thought from day one was that I wanted to find solutions for my players when the ball reached them, as I could not. If my players don't understand something, I force the player to ask me why we are doing such movement or working on certain tactics in training both offensively or defensively. I always want my players to be fully understanding of the problem. I want them to understand why we are doing certain things and why those things are useful." — Conte on his use of tactical systems. As a manager, Conte is known for using the 3–5–2 formation (or in certain cases, its more defensive variant, 5–3–2), fielding two wingbacks in lieu of wingers, with two out-and-out strikers backed by an attacking box-to-box midfielder in a three-man midfield, in front of a three-man defensive line. During his time as head coach of Juventus, he won three consecutive Serie A titles using the 3–5–2 formation, which also soon began to be employed by several other Serie A clubs. In his time at Bari he was noted for his unorthodox 4–2–4 formation, a modification of the classic 4–4–2, in which the outside midfielders act as attacking wingers. Some commentators have also observed that, although Conte's teams are capable of playing a short passing possession game, in which the ball is played out from the back on the ground, they are mainly known for their direct style of attacking play, as well as their ability to utilise long balls and score from counter-attacks with few touches; however, Conte has rejected claims that his teams prefer to sit back and play on the counter-attack. Defensive solidity has been highlighted as a hallmark of his sides, as well as the effective use of high and aggressive pressing in order to put pressure on opponents and win back the ball quickly. Conte's teams have also been described as possessing notable virtues such as pace, athleticism, high work-rates, versatility and tactical intelligence. Conte's work in restoring Juventus to the top of Italian football won critical acclaim and earned him comparisons with José Mourinho, Marcello Lippi and Arrigo Sacchi, primarily due to his obsession with tactics, his winning mentality and ability to foster great team spirit among his players. He also demonstrated a notable tactical versatility and meticulousness as a coach, adopting several different formations in an attempt to find the most suitable system to match his players' skills. The formations he adopted included 4–2–4, 4–1–4–1, 3–3–4, and 4–3–3, before he finally settled on his now trademark 3–5–2 or 5–3–2 formation while also using a 3–5–1–1 formation on occasion, as a variation upon this system. The resulting system was key to the club's success as the three-man midfield line-up, flanked by wingbacks, allowed veteran star Andrea Pirlo to function creatively as a deep-lying playmaker, with the younger and more dynamic Arturo Vidal and Claudio Marchisio either supporting him defensively or contributing offensively by making attacking runs into the area. Conte's use of heavy pressing high up on the pitch allowed his players to win back the ball quickly after losing it, and enabled Juventus to dominate possession during matches, which gave Pirlo more time to orchestrate the team's attacking moves. The organised back-line at Juventus formed by Chiellini, Bonucci, and Andrea Barzagli proved to be a strong defensive line-up, as Juventus finished the 2011–12 Serie A season with the best defence in the league; the three-man defence also allowed the central defender, Bonucci, to operate in a free role, and advance into midfield as a ball-playing centre-back, providing an additional creative outlet whenever Pirlo was heavily marked. Luca Marrone commented on Conte's demanding and meticulous approach as a coach, stating, "It takes time to accept the sheer amount of work he is asking of you. Everything he does, in preparation or tactical organisation, is done with maniacal precision and attention to detail. It can be overwhelming at first. But when you realise by buying into it you can win things, you follow." Conte's teams are also known for their versatility and ability to adopt different formations during a match, depending on whether his team are in possession or playing off the ball. At Euro 2016, Italy adopted a fluid 3–5–2 formation under Conte, in which the wide midfielders or wingbacks effectively functioned as wingers in a 3–3–4 formation when attacking, and as fullbacks in a 5–3–2 formation when defending behind the ball. Although the level of talent in the Italian squad was initially criticised in the media, Conte's tactics and Italy's solidity and organisation, from both a defensive and offensive standpoint, drew praise from pundits. In his first season as Chelsea manager, Conte started with a 4–1–4–1 formation, but after two comprehensive defeats to Arsenal and Liverpool early in the season, he changed the system to a fluid 3–4–2–1, with his trademark three-man defence consisting of David Luiz, César Azpilicueta and Gary Cahill, two defensive-minded midfielders in N'Golo Kante and Nemanja Matić, two wing-backs equally capable at also playing as wingers (Victor Moses and Marcos Alonso), and a three-man attack spearheaded by striker Diego Costa and crucially assisted by outside forwards Eden Hazard and Pedro or Willian. This system depends on the constant positional movement of attacking players, with the two wide forwards moving inside when the full-backs make overlapping forward runs, thus effectively forming a 3–4–3 and at times a 3–4–1–2. When losing the ball, players' quick defensive transitions make the system easily transform into a compact 5–4–1. Chelsea's performances improved dramatically after the tactical change, with 13 consecutive wins in the Premier League, and the club eventually went on to win the league title that season. Conte drew praise for his role in revitalising the team in the media, with BBC pundit John Motson describing Chelsea's 5–0 home win against Everton on 5 November 2016 as the best 90-minute performance he had ever seen in the Premier League. Although Conte's decision to reacquire David Luiz was initially met with criticism in the media, due to some poor defensive performances for Chelsea in the past, Conte's switch to a three-man back-line saw the Brazilian excel in a new role as a ball playing centre-back, due to his technique and range of passing. Conte described David Luiz as being "crucial" to the team's success, and praised him for working to improve his composure and concentration. In addition to their tactical discipline and organisation, Chelsea also drew praise for their fitness, effective use of high pressing, and their ability to win the ball back quickly, as well as their work-rate under Conte, which was attributed to the team's highly rigorous preseason training, which Cahill described as one of the "hardest" he's ever experienced. Italy defender Leonardo Bonucci singled out Conte for his role in motivating the players and creating a unified team environment at Euro 2016, commenting that the players had given their coach the nickname The Godfather, for the way he made them want to listen when he spoke. Pirlo has also remarked approvingly of Conte's man-management and motivational skills. In his autobiography he recalled how Conte's introductory speech to the Juventus squad left a significant impression on him: "He needed only one speech, with many simple words, to conquer both me and Juventus. He had fire running through his veins and he moved like a viper. 'This squad, dear boys, is coming off two consecutive seventh-place finishes. It's crazy. It's shocking. I am not here for this, so it's time to stop being so crap.'... When Conte speaks, his words assault you. They crash through the doors of your mind. I've lost count of the number of times I've said: 'Hell, Conte said something really spot-on again today.'" In addition to his comparisons to José Mourinho, some commentators have also remarked on his managerial similarities to Sir Alex Ferguson, using an anecdote from his final season as Juventus manager to illustrate his formidable temper. Prior to the team talk ahead of the final game of the 2013–14 season, Juventus goalkeeper Gianluigi Buffon arrived with the club's chief executive who Buffon claimed wanted to speak to the players over how much they were due in win bonuses having won the title. "The suggestion sent Conte into a fury. He chased every player out of the room as he tore into Buffon. 'I don’t want to hear another word,' Conte is said to have screamed. 'From you, of all people, I would never have expected such a thing. Bonuses … You’re a disappointment, a defeat from the moment you open your mouth. Just like all the rest of these half-wits.'" Juventus won the game 3–0 and set a new record for the most points and wins in a single Serie A season. Conte is also known for adopting a very strict approach when it comes to his players' diets and curfew before matches. Prior to Euro 2012, Conte was accused of failure to report attempted match-fixing during his time as manager of Siena by ex-Siena player Filippo Carobbio, connected with the betting scandal of 2011–12. Carobbio, after himself being charged with extensive involvement in the scandal, claimed that during the technical meeting prior to a match between Siena and Novara, Siena owner Massimo Mezzaroma indirectly sent a message to the players asking them to ensure the match finished in a draw in order to help Mezzaroma turn a large profit on a bet he had made. The match finished 2–2 and Carobbio testified Conte was present when the message was relayed to the players in advance of the match. Carrobio also asserted the result of the final match of the season, in which Siena lost 1–0 to AlbinoLeffe, was prearranged after Siena's assistant manager asked he and another player "contact someone at AlbinoLeffe to reach an agreement over the return match". Further accusations were also leveled at Conte over Siena's 5–0 victory over Varese that season, specifically that he knew they had been asked to lose the game and did not report it. Conte's lawyer, Antonio De Rencis, reported his client strenuously denied the accusations and maintained he had no knowledge of any attempts to fix the matches in which he was involved. To date, none of the 23 other Siena players have supported Carobbio's accusations. Conte took the advice of his lawyers and attempted to strike a plea bargain which would have seen him served with a three-month ban and fine of €200,000, under Article 23 of Italian law without admission of guilt. On 1 August 2012, this plea bargain was rejected. On 10 August, the FIGC suspended him from football for the following ten months for failing to report match-fixing in the Novara–Siena and AlbinoLeffe–Siena fixtures. Conte again maintained his innocence and appealed the verdict. On 22 August 2012, the Federal Court of Justice dropped the accusation about the Novara–Siena fixture. Federal Court member Pietro Sandulli commented, "[I]t seemed illogical that such a senior and experienced coach would say in the locker room 'we're drawing this one' in front of 25 players." However, the Court confirmed the ten-month ban for the AlbinoLeffe match would be upheld as there was no way he could not have known of the actions of his assistant manager Cristian Stellini, with the presiding judge adding that Conte was "lucky" not to have been handed a longer sentence. On 23 August 2012, Juventus announced an appeal to Italy's sports arbitration panel against the ban. Following the appeal, Conte's touchline ban was reduced to four months. Juventus' management and players dedicated their Supercoppa Italiana win to Conte. In May 2016, the preliminary hearing judge of the court of Cremona acquitted Conte of all charges in regard to his alleged involvement in the match-fixing scandal from the 2010–11 season, during his time with Siena in Serie B. Despite Conte's success at Juventus, there were indications that his departure from the club in May 2014 was not as amicable as had been portrayed, with observers pointing to a comment he made in the immediate aftermath of the club's 2014 title success. When asked what plans were in place for the following season Conte responded, "Well, you cannot go to eat at a €100 restaurant with just €10 in your pocket, can you? ", which was interpreted as a veiled criticism of the lack of funds made available for transfers by the Juventus executive. In addition to this remark, Conte had chosen to resign on the second day of pre-season training, something that took fans by surprise. There was much controversy surrounding Italy's Euro 2016 qualifying match on 28 March 2015 against Bulgaria, as Conte called up Brazilian-born Éder and Argentine-born Franco Vázquez. Both players hold an Italian citizenship as they have relatives that are Italian, allowing them to be eligible to play for Italy. Speaking at a Serie A meeting on 23 March 2015, Roberto Mancini said, "The Italian national team should be Italian. An Italian player deserves to play for the national team while someone who wasn't born in Italy, even if they have relatives, I don't think they deserve to." Conte's response to the use of foreign-born players was, "If Mauro Camoranesi [who was born in Argentina] was allowed to help Italy win the 2006 World Cup, then why can't Éder and Franco Vázquez lead the Azzurri to glory in next year's European Championship?" In late May 2016, Conte was criticised in the North American media for his omission of Andrea Pirlo and Sebastian Giovinco from Italy's 30-player shortlist for its Euro 2016 squad, and for his comments regarding the quality of their league, Major League Soccer. Conte had stated in a press conference, "When you make a certain choice and go to play in certain leagues, you do so taking it into account that they could pay the consequences from a footballing viewpoint." On 23 October 2016, while his team were leading 4–0 against José Mourinho's Manchester United, Conte waved up the home crowd, asking them to make more noise to support Chelsea. However, media reports claimed his actions were meant to antagonise Mourinho and humiliate the visiting team. Conte refuted these claims, saying, "I've been a player too and I know how to behave. I always show great respect for everyone, including Manchester United. There was no incident, it was just a normal thing to do. I wasn't mocking anyone, I wouldn't do that. Today it was right to call our fans in a moment when I was listening to only the supporters of Manchester United at 4–0. The players, after a 4–0 win, deserved a great clap. It's very normal. If we want to cut the emotion we can go home and change our job." Although Conte was criticised for his behaviour by Mourinho, Chelsea winger Pedro supported Conte's actions. Conte and his wife Elisabetta have a daughter, Vittoria. The couple had been together for 15 years before marrying in June 2013. Conte has expressed his gratitude to his family for their support during the Scommessopoli match-fixing scandal investigations in 2011–12: "I have a great woman by my side, one who always tries to understand me. As for my daughter, she is the other woman in my life. She is beginning to understand that her dad gets nervous when he does not win [a match]." In addition to his native Italian, Conte can also speak English. Conte is Catholic. ^ "Conte: Antonio Conte: Manager". BDFutbol. Retrieved 3 May 2018. ^ "Antonio Conte". FIFAA. Retrieved 21 December 2017. ^ "Antonio Conte". Worldfootball.net. Retrieved 5 August 2016. ^ Luciano Canepari. "Antonio". DiPI Online (in Italian). Retrieved 26 October 2018. ^ Luciano Canepari. "conte". DiPI Online (in Italian). Retrieved 26 October 2018. ^ "Conte ready to carve out his Italy vision". FIFA. Retrieved 11 September 2014. 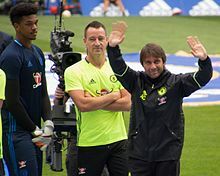 ^ "Only Antonio Conte could have won the Premier League title with Chelsea's squad, writes Tony Evans". ^ a b c d e f g Bedeschi, Stefano. "Gli eroi in bianconero: Antonio CONTE" (in Italian). Tutto Juve. Retrieved 11 September 2014. ^ a b c d e f Rizzo, Sergio. "CONTE, Antonio" (in Italian). Treccani: Enciclopedia dello Sport (2002). Retrieved 2 November 2016. ^ "17-11-1991, l'esordio bianconero di Conte – Conte's Juventus debut". Juventus F.C. YouTube. 17 November 2011. Retrieved 6 January 2012. ^ Winter, Henry (29 May 2003). "Shevchenko the Milan master". The Daily Telegraph. Retrieved 2 November 2016. ^ "Harsh penalty hands Italy victory". BBC Sport. 11 June 2000. Retrieved 25 June 2011. ^ a b c "Conte, Antonio" (in Italian). Italian Football Federation. Archived from the original on 22 March 2016. Retrieved 2 November 2016. ^ a b c "Antonio Conte competition coaching record". UEFA. Retrieved 11 September 2014. ^ a b c Prior, Gary M. (13 July 2000). "Profile: Antonio Conte". ESPN FC. Retrieved 22 February 2017. ^ a b "Great Italian tacticians influenced me, says Conte". FourFourTwo. 29 December 2013. Retrieved 2 November 2016. ^ "Euro 2000 Profile: Italy - Antonio Conte". BBC Sport. Retrieved 11 September 2014. ^ Basilico, Mario (9 June 2014). "Da Conte a Inzaghi, tutti gli uomini di Ancelotti" [From Conte to Inzaghi, all of Ancelotti's men] (in Italian). Spazio Juve. Archived from the original on 22 December 2015. Retrieved 17 September 2015. ^ "Calcio / Bari – Materazzi si dimette". La Gazzetta del Mezzogiorno (in Italian). 28 December 2007. Retrieved 6 April 2017. ^ "L'allenatore Juve? La certezza: decide Lippi" (in Italian). Goal.com. 21 May 2009. ^ Landolina, Salvatore (11 May 2009). "Antonio Conte: I Am Ready To Coach Juventus". Goal.com. Retrieved 4 July 2012. ^ "Comunicato Stampa" (in Italian). Atalanta B.C. 21 September 2009. Archived from the original on 31 October 2009. Retrieved 21 September 2009. ^ "Il tecnico litiga con i tifosi E viene portato via a forza". Bergamo News (in Italian). 6 January 2010. Archived from the original on 22 July 2011. Retrieved 7 January 2010. ^ "Giuseppe Marotta reveals Juventus will appoint Antonio Conte as new coach next week". Goal.com. 22 May 2011. Retrieved 6 April 2017. ^ "Conte replaces Del Neri at Juventus". ESPN FC. 31 May 2011. Retrieved 25 June 2011. ^ a b "Juve scoop two awards at Trofeo Maestrelli ceremony". Juventus F.C. 13 November 2012. Archived from the original on 3 December 2013. ^ "Juventus wrap up Italian Serie A championship in style". BBC Sport. 6 May 2012. Retrieved 28 May 2012. ^ a b D'souza, Chelston (4 April 2012). "Juventus' Corner: Why Marchisio, Vidal And Pirlo Form Serie A's Best Midfield". TheHardTackle. Retrieved 15 December 2015. ^ a b c Stenti, Simone (27 June 2012). "Euro 2012: Juventus renaissance transforms Cesare Prandelli's Italy". The Guardian. ^ Winton, Richard (4 May 2014). "Juventus: Antonio Conte's vision revived Juve, says Andrea Pirlo". BBC Sport. Retrieved 12 April 2016. ^ Bandini, Paolo (21 May 2012). "Napoli ruin Del Piero's final farewell with Coppa Italia win over Juventus". The Guardian. Retrieved 20 March 2016. ^ "Juventus Beats Cagliari to Set European Points Record". The New York Times. 19 May 2014. Retrieved 11 September 2014. ^ Gladwell, Ben (6 May 2014). "Juventus won't add 3rd star to badge". ESPN FC. Retrieved 16 March 2016. ^ "Antonio Conte quits as coach of Italian champions". BBC Sport. 15 July 2014. Retrieved 16 July 2014. ^ a b Schiavone, David (28 January 2013). "Gran Gala del Calcio 2012 – Winners". Forza Italian Football. Retrieved 16 December 2015. ^ a b "Panchina d'Oro, vince Conte, poi Montella e Mazzarri". La Gazzetta dello Sport (in Italian). 3 March 2014. Retrieved 18 May 2016. ^ a b "Calcio, panchina d'oro ancora a Conte: La mia Juve sarebbe a +20" [Football, golden bench to Conte again: "My Juve would be 20 points ahead"]. la Repubblica (in Italian). 9 March 2015. Retrieved 16 December 2015. ^ "Antonio Conte confirmed as new Italy boss". BBC Sport. 14 August 2014. Retrieved 14 August 2014. ^ "'Conte's 3–5–2 best ever, but…'". Football Italia. 14 November 2014. Retrieved 15 December 2015. ^ "Conte: 'Pirlo in 4–3–3'". Football Italia. 11 June 2015. Retrieved 15 December 2015. ^ Clari, Valerio (9 September 2014). "Euro 2016, qualificazioni. Norvegia-Italia 0–2. Gol di Zaza e Bonucci". La Gazzetta dello Sport (in Italian). Retrieved 11 September 2014. ^ Horncastle, James (11 October 2015). "Italy qualify for Euro 2016 but are they improving under Antonio Conte?". ESPN FC. Retrieved 13 October 2015. ^ "Official: Conte to leave Italy". Football Italia. 15 March 2016. Retrieved 15 March 2016. ^ a b Horncastle, James (21 June 2016). "Italy's start to Euro 2016 shows you should never underestimate them". ESPN FC. Retrieved 3 July 2016. ^ Scholten, Berend; Gladwell, Benjamin (13 June 2016). "Belgium 0–2 Italy". UEFA. Retrieved 13 June 2016. ^ a b Marcotti, Gabriele (13 June 2016). "Antonio Conte's scheme works as Italy beat Belgium, but it wasn't perfect". ESPN FC. Retrieved 15 June 2016. ^ a b Macintosh, Iain (13 June 2016). "Antonio Conte guides Italy to tactical masterclass over Belgium". ESPN FC. Retrieved 15 June 2016. ^ Bull, JJ (2 July 2016). "Germany vs Italy, Euro 2016: Germans win the shootout after Bonucci penalty cancels out Ozil opener". The Daily Telegraph. Retrieved 2 July 2016. ^ "Antonio Conte excited for Chelsea 'adventure' after Italy's Euro 2016 exit". SkySports. 3 July 2016. Retrieved 3 July 2016. ^ "Official: Conte signs with Chelsea". Football Italia. 4 April 2016. Retrieved 4 April 2016. ^ "Conte appointed". Chelsea F.C. 4 April 2016. Retrieved 29 May 2016. ^ "Diego Costa's late winner helps Chelsea defeat West Ham in opener". ESPN FC. 15 August 2016. ^ "Report: Crystal Palace 0 Chelsea 1". Chelsea F.C. 17 December 2016. ^ Delaney, Miguel (31 December 2016). "Willian, Chelsea make it lucky 13 vs. Stoke City". ESPN. Retrieved 2 January 2017. ^ McNulty, Phil (4 January 2017). "Tottenham Hotspur 2–0 Chelsea". BBC Sport. Retrieved 4 January 2017. ^ "Conte named Barclays Manager of the Month". Premier League. 18 November 2016. Retrieved 18 November 2016. ^ "Three in a row for Conte". Chelsea F.C. 13 January 2017. Retrieved 13 January 2017. ^ "West Brom 0-1 Chelsea". The Guardian. 12 May 2017. Retrieved 21 May 2017. ^ "Chelsea win the Premier League: The numbers behind Blues' unsung heroes". BBC Sport. 13 May 2017. Retrieved 21 May 2017. ^ Chris Murphy; Adam Hurrey (21 May 2017). "Premier League Gameweek 38". PremierLeague.com. Retrieved 21 May 2017. ^ "Conte signs new deal with Chelsea". Premier League. 18 July 2017. Retrieved 18 July 2017. ^ "Chelsea coach Antonio Conte charged with misconduct by FA after being sent to the stands vs Swansea". Evening Standard. ^ Sam Wallace (19 May 2018). "Eden Hazard penalty settles FA Cup final as Chelsea edge past Man Utd". The Telegraph. Retrieved 19 May 2018. ^ "Antonio Conte: Chelsea sack Italian after two years in charge". BBC Sport. 13 July 2018. Retrieved 13 July 2018. ^ Horncastle, James (8 April 2016). "Antonio Conte will fit in at Chelsea, but will Chelsea fit with Antonio Conte?". ESPN FC. Retrieved 8 April 2016. ^ Sindhu, Anand (19 October 2013). "Juventus Supremacy of Europe". Football Speak. Archived from the original on 15 July 2014. ^ Tidey, Will (31 October 2012). "4–2–3–1 Is the New Normal, but Is Serie A's 3–5–2 the Antidote?". Bleacher Report. Retrieved 15 December 2015. ^ a b "Conte: 'How Italy went to 4–2–4'". Football Italia. 11 October 2015. Retrieved 15 December 2015. ^ "New beginnings for Massimiliano Allegri's Juventus". Yahoo Sports. 18 September 2014. Retrieved 14 April 2016. ^ Smith, Peter (15 March 2016). "The view from Italy on Antonio Conte and what he would bring to Chelsea". Sky Sports. Retrieved 12 April 2016. ^ Burt, Jason (24 February 2016). "Chelsea close to appointing Antonio Conte as manager". The Daily Telegraph. Retrieved 13 April 2016. ^ Lea, Greg (4 June 2015). "How Massimo Allegri made Juventus a European superpower once more". Eurosport. Retrieved 13 April 2016. ^ Cetta, Luca (10 May 2012). "Mastermind Conte". Football Italia. Retrieved 13 April 2016. ^ Horncastle, James (2 June 2016). "Getting Italy to perform at Euro 2016 Conte's greatest managerial test yet". ESPN FC. Retrieved 3 June 2016. ^ a b Ducker, James (15 June 2016). "Italy hail the new 'special one' Antonio Conte". The Daily Telegraph. Retrieved 2 February 2017. ^ Adrian Clarke (7 August 2016). "Conte ready to crack the whip". PremierLeague.com. Retrieved 21 May 2017. ^ Marchetti, Simona (17 September 2012). "Conte è il Mourinho italiano Così la Juve fa paura agli inglesi". La Gazzetta dello Sport (in Italian). Retrieved 21 March 2016. ^ Horncastle, James (4 April 2016). "'Italian Mourinho' Antonio Conte will be shock for Chelsea players after gentle Guus". The Daily Telegraph. Retrieved 3 July 2016. ^ Capuano, Giovanni (27 June 2016). "Euro 2016: grande Italia, ora puoi sognare! E Conte sembra Lippi". Panorama (in Italian). Retrieved 31 October 2016. ^ Nerozzi, Massimiliano (30 June 2013). "Juve all'attacco, versione 3–3–4 L'ultima evoluzione di Conte" [Juve on the offensive, version 3–3–4 Conte's latest evolution]. La Stampa (in Italian). Retrieved 15 December 2015. ^ Tossani, Michele (25 July 2013). "Tactical Analysis: Is a 3–3–4 the tactical future for Antonio Conte's Juventus?". Think Football. Archived from the original on 22 December 2015. Retrieved 15 December 2015. ^ Paolo Bandini (7 May 2012). "Unbeaten Juventus scale the barriers to be crowned champions again". The Guardian. Retrieved 21 May 2017. ^ Paolo Condò (7 December 2012). "E' nata una grande Juve Conte avanza senza l'ariete" (in Italian). La Gazzetta dello Sport. Retrieved 21 May 2017. ^ Mina Rzouki (26 September 2012). "Juventus struggle for a point against Fiorentina". ESPN FC. Retrieved 21 May 2017. ^ "Old Lady never more sprightly". FIFA.com. 11 May 2012. Retrieved 21 May 2017. ^ Cetta, Luca (11 April 2012). "The redemption of Bonucci". Football Italia. Retrieved 15 March 2016. ^ a b Barney Ronay (13 May 2017). "Antonio Conte's brilliance has turned Chelsea's pop-up team into champions". The Guardian. Retrieved 21 May 2017. ^ Moore, Glenn (27 June 2016). "Italy vs Spain Euro 2016 reaction: Antonio Conte hails his Azzurri side despite 'not the rosiest period in talent'". The Independent. Retrieved 2 February 2017. ^ Bull, JJ (2 July 2016). "How Antonio Conte made Italy genuine Euro 2016 contenders". The Daily Telegraph. Retrieved 2 February 2017. ^ John Robertson (24 June 2016). "4 ways Antonio Conte can implement his Italian style at Chelsea". FourFourTwo. Retrieved 21 May 2017. ^ Duffy, Alan (31 December 2016). "Chelsea Equal Record For Consecutive Wins In Single Premier League Season, Enjoy Hard-Fought 13th Victory Against Stoke (Photos)". Who Ate all the Pies. ^ "Antonio Conte's tactical shift cures Chelsea from back to front". The Daily Telegraph. 24 October 2016. ^ Dan Levene (7 November 2016). "Chelsea laying claim to Barcelona legacy with Conte's masterstroke". Eurosport. Retrieved 14 November 2016. ^ Liam Twomey (15 April 2017). "Chelsea never doubted David Luiz's quality as top defender - Antonio Conte". ESPN FC. Retrieved 21 May 2017. ^ Miguel Delaney (20 September 2016). "What's it like to train as a Chelsea player? Inside Conte's fitness regime". ESPN FC. Retrieved 10 April 2017. ^ Jonathan Liew (22 October 2016). "Antonio Conte's favoured 3-4-3 is now football's fashionable formation". The Daily Telegraph. Retrieved 21 May 2017. ^ Miguel Delaney (1 February 2017). "Antonio Conte on revenge mission as Chelsea boss displays his emotion in bid to right the wrongs against Arsenal". The Independent. Retrieved 21 May 2017. ^ Jon Culley (2 October 2016). "Chelsea tighten up at back as Antonio Conte turns to tried and trusted formation". The Daily Telegraph. Retrieved 21 May 2017. ^ "Conte: High pressure". Chelsea F.C. 3 October 2016. Retrieved 21 May 2017. ^ Vaishali Bhardwaj (13 July 2016). "'Godfather' Antonio Conte will be a big success at Chelsea, says Blues target Leonardo Bonucci". The Evening Standard. Retrieved 20 August 2017. ^ a b c d e Taylor, Daniel (27 February 2016). "Antonio Conte ticks all the boxes but court case could be a distraction for Chelsea". The Guardian. Retrieved 15 March 2016. ^ a b Bandini, Paolo (4 April 2016). "Antonio Conte: the volcanic manager who will never settle for second best at Chelsea". The Guardian. Retrieved 4 April 2016. ^ Cetta, Luca. "JUVENTUS: 2013–14 Review". Football Italia. Retrieved 12 April 2016. ^ Lim, Jeremy (30 May 2012). "Conte knew Siena president Mezzaroma asked us to lose, reveals Carobbio". Goal.com. ^ Riach, James (28 May 2012). "Juventus's Antonio Conte investigation". The Guardian. ^ Campanale, Susy (2 August 2012). "Conte's stand". Football Italia. Retrieved 15 March 2016. ^ "No al patteggiamento per Conte, – 6 il Siena, Grosseto rischio Lega Pro" (in Italian). Italian Football Federation. 1 August 2012. Archived from the original on 2 December 2013. Retrieved 3 August 2012. ^ "Conte handed 10-month ban in Scommessopoli scandal". Goal.com. 10 August 2012. Retrieved 10 August 2012. ^ a b Tooth, John-Paul (22 August 2012). "Italian judge: Conte lucky ban was not longer". Goal.com. Retrieved 6 April 2017. ^ "Calcioscommmesse, le motivazioni della sentenza-Conte". Il Messaggero. 24 August 2012. Archived from the original on 27 August 2012. ^ "Antonio Conte has 10-month ban upheld by tribunal". BBC Sport. 22 August 2012. ^ "Juventus coach Antonio Conte has ban reduced". Forza Italian Football. 5 October 2012. ^ Ali, Mohammed (11 August 2012). "Juventus dedicate Supercoppa Italiana win to banned Conte". Goal.com. Retrieved 28 August 2012. ^ "Antonio Conte cleared over 2011 match-fixing scandal". BBC Sport. 16 May 2016. Retrieved 16 May 2016. ^ Agnew, Paddy (16 July 2014). "Conte's departure from Juve leaves Italian football guessing". The Irish Times. Retrieved 17 August 2016. ^ "Antonio Conte defends use of foreign-born players on Italy squad". ESPN FC. 23 March 2015. ^ Mooney, Niall (26 May 2016). "Conte criticised after MLS jibe". La Gazzetta dello Sport. Retrieved 27 May 2016. ^ Gladwell, Ben (24 May 2016). "MLS play cost Andrea Pirlo, Sebastian Giovinco their Italy chance – Conte". ESPN FC. Retrieved 27 May 2016. ^ "Antonio Conte: Chelsea boss says he "did not mock Manchester United"". BBC Sport. 23 October 2016. ^ Garcia, Adriana (25 October 2016). "Antonio Conte defended by Chelsea's Pedro after Jose Mourinho exchange". ESPN FC. Retrieved 25 October 2016. ^ "Conte: "Scommesse? Sono sereno"" [Conte: "Gambling? I'm calm"]. La Stampa (in Italian). 19 June 2012. ^ "Antonio Conte sposa Elisabetta Muscarello: nozze da campioni" (in Italian). Oggi. 10 June 2013. ^ "Conte: "Resto sereno. La verità verrà a galla"" [Conte: "I remain optimistic. The truth will come out"]. Corriere dello Sport (in Italian). 19 June 2012. Archived from the original on 16 January 2016. Retrieved 16 December 2015. ^ "Begovic already impressed by Conte". FourFourTwo. 14 May 2016. Retrieved 14 May 2016. ^ "Nazionale, Conte e la fede: Dio mi ha dato tanto. Visita al Palermo: "Qui per Dybala e Vazquez"" (in Italian). La Repubblica. 26 November 2014. Retrieved 20 August 2017. ^ a b "Managers: Antonio Conte". Soccerbase. Centurycomm. Retrieved 29 December 2017. ^ "A. Conte". Soccerway. Retrieved 16 December 2015. ^ Massimo Perrone (17 August 2013). "Supercoppa Lazio-Juve ai raggi X: tutti i numeri della sfida" (in Italian). La Gazzetta dello Sport. Retrieved 15 January 2018. ^ a b c "Manager profile: Antonio Conte". Premier League. Retrieved 19 September 2018. ^ McNulty, Phil (19 May 2018). "Chelsea 1–0 Manchester United". BBC Sport. Retrieved 27 May 2018. ^ Gerna, Jacopo (18 February 2013). "Panchina d'oro a Conte Premiata l'impresa con la Juve". La Gazzetta dello Sport (in Italian). Retrieved 16 December 2015. ^ "Italian players say Pirlo is the best (again)". FIFPro. 28 January 2014. Retrieved 16 December 2015. ^ "Antonio Conte rewarded at the Professional Footballers' Association (AIC) Gala". Vivo Azzurro. 16 December 2014. Retrieved 16 December 2015. ^ "Globe Soccer Awards 2013". Globe Soccer. Retrieved 16 December 2015. 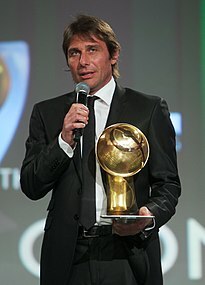 ^ "Antonio Conte named Italy's top coach award for fourth straight year". espn.com. 18 December 2015. ^ "Blues honoured at London Football Awards". Chelsea F.C. Retrieved 3 March 2017. ^ "Chelsea's Antonio Conte wins special award at 2017 GQ Men of the Year gala". EveningStandard. Retrieved 6 September 2017. ^ "The Best FIFA Men's Coach". FIFA.com. Retrieved 23 October 2017. ^ "ONORIFICENZE" (in Italian). quirinale.it. 12 July 2000. Archived from the original on 10 January 2016. Retrieved 19 March 2015. Wikimedia Commons has media related to Antonio Conte.